When housing pesticide storage it is very important for your pesticide storage building to have more space compared to the volume of pesticides that are being stored. Stacking pesticide storage can cause leaks, spills, and hazardous situations. Leaks or spills can cause run-off and contaminate the groundwater. Each state regulates pesticide storage differently. Pesticide storage must be dated and numbered so you can keep track of what pesticide container must be used first. It is very important that pesticide storage is monitored and managed with caution. 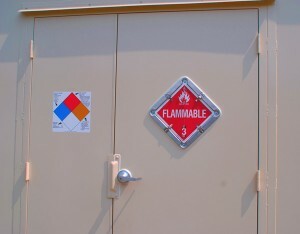 U.S. Chemical Storage provides fully compliant storage solutions. A dry and completely enclosed storage building is necessary. Most states require a secondary sump containment to contain pesticide leaks or spills. Large quantities of pesticide storage can be very dangerous to handle and store, therefore proper containment and maintenance is required. There are proper pesticide storage containers that can be implemented very close to your project or farm, leading to increased production. It is wise to take a look at rules and regulations that are in place for your state. The state rules and regulations can provide important checkpoints that need to be met. In order to isolate the toxic chemical, proper steps to maintain it must be met. Pesticide storage, depending on the volume of the storage and type of pesticides being stored, must have mechanical ventilation systems implemented into the pesticide storage building in order to meet all safety and compliant measures. Pesticide storage buildings by U.S. Chemical Storage are specifically designed for storing pesticides and keeping pesticides maintained and compliant. U.S. Chemical Storage storage buildings are 100% customizable and made from heavy-gauge, leak-proof steel, in order to keep your pesticide storage completely maintained. We offer a full line of customizable accessories, such as ventilation systems, explosion proof temperature controls, lighting, sensors, alarms, and more. With our customizable accessories your storage building will be 100% fully compliant. Our storage buildings feature a leak-proof secondary sump containment to contain pesticide storage, in the event of a pesticide leak or spill. There are severe consequences that go along with improperly storing or misusing pesticide storage. Keep compliant with a storage building by U.S. Chemical Storage.